The tutorial shows how to calculate mean in Excel for different data types by using AVERAGE or AVERAGEA formulas. You will also learn how to use the AVERAGEIF and AVERAGEIFS functions to average cells that meet certain criteria. 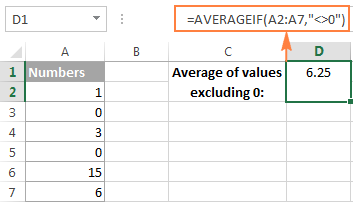 In plain English, calculating the average for a set of values if finding out the most common value in the set. For example, if a few athletes have run a 100m sprint, you may want to know the average result - i.e. how much time most sprinters are expected to take to complete the race. In mathematics, average is called the arithmetic mean, or simply the mean, and it is calculated by adding a group of numbers together and then dividing by the count of those numbers. To calculate average in Excel, you won't need to write such mathematical expressions, powerful Excel Average functions will do the work behind the scene. Further on in this tutorial, we will discuss the syntax of each function and illustrate it with examples of uses. Excel AVERAGE - calculate the mean of cells with numbers. Excel AVERAGEIF - average cells based on a given criterion. Excel AVERAGEIFS - average cells that match several criteria. You use the AVERAGE function in Excel to return the average (arithmetic mean) of the specified cells. Number1, number2, … are numeric values for which you want to find the average. The first argument is required, subsequent ones are optional, and up to 255 arguments can be included in a single formula. The parameters can be supplied as numbers, cell references, or ranges. AVERAGE is one of the most straightforward and easy-to-use Excel functions, and the following examples prove this. To find out an average of certain numbers, you can supply them directly in your Excel average formula. For example, =AVERAGE(1,2,3,4) returns 2.5 as the result. To return an average of non-adjacent cells, you supply each cell individually, e.g. Apart from numbers, you can use the Excel AVERAGE function to calculate an average of other numeric values such as percentages and times, as demonstrated in the following examples. Note. Please pay attention that the Excel AVERAGE function includes zero values when calculating an average. If you'd rather exclude zeros, use AVERAGEIF instead, as demonstrated in the following example. As you may remember, at the beginning of this tutorial, we found out the average time of three 100m sprinters with a pretty simple calculation. But what if you want to average times that include hours, minutes and seconds? Calculating different time units manually, would be a real pain… but the AVERAGE formula in Excel copes perfectly. Excel AVERAGE function - things to remember! As you've just seen, using the AVERAGE function in Excel is easy. However, it does have a few specificities that you need to be aware of. Cells with zero values (0) are included in the average. Cells containing text strings, Boolean values of TRUE and FALSE, and empty cells are ignored. If you want to include Boolean values and text representations of numbers in the calculation, use the AVERAGEA function. Boolean values that you type directly in the Excel AVERAGE formula are counted. For example, the formula =AVERAGE(TRUE, FALSE) returns 0.5, which is the average of 1 and 0. Note. When using the AVERAGE function in Excel sheets, please do keep in mind the difference between cells containing zero values and blank cells - 0's are counted, but empty cells are not. This might be especially confusing if the "Show a zero in cells that have a zero value" option is unchecked in a given sheet. You can find this option under Excel Options > Advanced > Display options for this worksheet. The AVERAGEA function is similar to Excel AVERAGE in that it calculates the average (arithmetic mean) of the values in its arguments. The difference is that AVERAGEA includes all non-empty cells in a calculation, whether they contains numbers, text, Boolean values of TRUE and FALSE, and empty strings returned by other formulas. Value1, value2, … are values, arrays, cell references or ranges that you want to average. The first argument is required, others (up to 255) are optional. Excel AVERAGEA function - things to remember! Text values, including empty strings ("") returned by other formulas, evaluate as 0. The Boolean value of TRUE evaluates as 1, and FALSE evaluates as 0. For example, the formula =AVERAGEA(2,FALSE) returns 1, which is the average of 2 and 0. The formula =AVERAGEA(2,TRUE) returns 1.5, which is the average of 2 and 1. So, if you do not want to include the Boolean values and text strings in your calculations, use the Excel AVERAGE function rather than AVERAGEA. The AVERAGEIF function in Excel calculates the average (arithmetic mean) of all the cells that meet a specified criteria. Range - the range of cells to be tested against the given criteria. Criteria - the condition used to determine which cells to average. The criteria can be supplied in the form of a number, logical expression, text value, or cell reference, e.g. 5, ">5", "cat", or A2. Average_range - the cells you actually want to average (optional). If omitted, the formula will calculate an average of the values in the range argument. The AVERAGEIF function is available in Excel 2016, Excel 2013, Excel 2011 for Mac, Excel 2010 and 2007. And now, let's see how you can use the Excel AVERAGEIF function on real-life worksheets to find an average of cells that meet your criteria. Tip. To round the returned value to a certain number of decimal places, either use one of the Excel round functions to round off the actual value stored in the cell, or the Format Cells dialog to change only the display formatting. Alternatively, you can select the cell with the formula (E1 in this example), press Ctrl + 1 to open the Format Cells dialog, switch to either the Number or Currency tab and select the number of decimal places you want to display. Please remember, in this case the actual value stored in a cell won't be changed, and the exact non-rounded value will be used in all calculations if you refer to that cell in other formulas. Use a question mark (?) to match any single character. Use an asterisk (*) to match any sequence of characters. To find an actual question mark or asterisk, type a tilde (~) before the character in the criteria. If your keyword are likely to be preceded and/or followed by some other characters, add an asterisk both in front of the word and after it, like =AVERAGEIF(A2:A8, "*banana*", B2:B8). Quite often, you may want to average cells where the quantity is greater than or less than a certain value. For example, we have a list of numbers in column A and we want to find an average of those that are greater than 10. As you may have noticed, we do not use the third argument [average_range] in either of the above formulas since we want to find an average in the initial range. When performing data analysis in Excel, you may often need to find an average of numbers that correspond either to empty or non-empty cells. To include blank cells that contain absolutely nothing (no formula, no zero length string), enter "=" in the criteria argument. 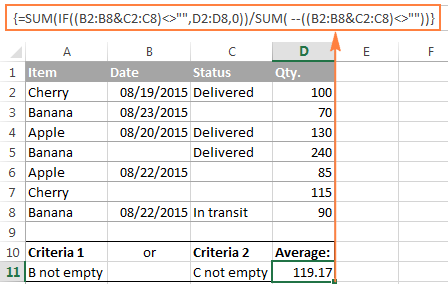 To find an average of values corresponding to non-empty cells, type "<>" in criteria. Instead of typing the criteria in a formula, you can refer to a certain cell where your users can input different values without altering your AVERAGEIF formula. If you use a logical expression with a cell reference or another function in criteria, then you have to enclose the logical operator in "double quotes" and add ampersand (&) to concatenate a cell reference or function. 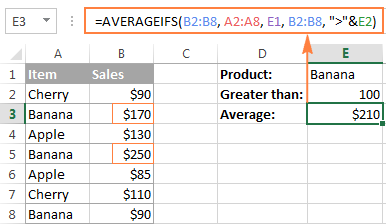 The AVERAGEIFS function in Excel is a plural counterpart of AVERAGEIF. It allows for multiple conditions and returns the average (arithmetic mean) of cells that meet all of the specified criteria. Average_range - the range of cells that you want to average. Criteria_range1, criteria_range2, … - 1 to 127 ranges to be tested against the specified criteria. Criteria_range1 is required, subsequent ones are optional. Criteria1, criteria2, … - 1 to 127 criteria that determine which cells to average. The criteria can be supplied in the form of a number, logical expression, text value, or cell reference. Criteria1 is required, additional criteria are optional. The AVERAGEIFS function is available in Excel 2016, Excel 2013, Excel 2011 for Mac, Excel 2010 and 2007. As already mentioned, the Excel AVERAGEIFS function finds average of cells that meet all of the criteria that you specify (AND logic). In essence, you use it similarly to AVERAGEIF, except that you can supply more than one criteria_range and criteria in a formula. Supposing that you have a list of items in column A and sales amounts in column B, let's find out an average of Banana sales that are greater than $100. 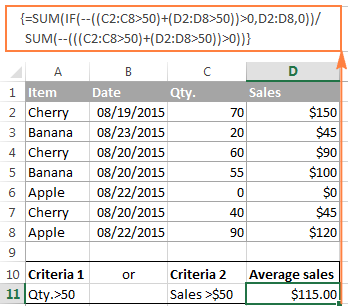 Criteria_range2 is B2:B8 (Sales column) and criteria2 is ">100". As you see, only two cells (B3 and B5) meet both conditions, and therefore only these cells are averaged. In criteria1, you enter a date preceded with a comparison operator. In criteria 2, you type "<>" that tells the formula to include only non-empty cells within citeria_range2 (column C in this example). Tip. When you use a number or date in conjunction with a logical operator in AVERAGEIFS' criteria, you enclose this combination in double quotes like "<8/21/2015". AVERAGEIF and AVERAGEIFS functions - things to remember! In the average_range argument, empty cells, Boolean values of TRUE/FALSE and text values are ignored. In the criteria / criteria_range argument, empty cells are treated as zero values (0). If average_range contains only blank cells or text values, both functions return the #DIV0! error. If not a single cell meets the criteria (all of the criteria in case of AVERAGEIFS), the #DIV0! error is also returned. Average_range does not necessarily have to be of the same size as range. However, the actual cells to be averaged are determined by the size of the range argument. In other words, the upper left cell in average_range is treated as the beginning cell, and includes as many columns and rows as contained in the range argument. Unlike the AVERAGEIF function, AVERAGEIFS requires each criteria_range to be of the same size as average_range. Since the Excel AVERAGEIFS function works with the AND logic and the AVERAGEIF function allows for 1 criterion only, we will have to make up our own formula to average with the OR logic. In other words, we will make a formula to calculate average in Excel if any of the specified conditions is met. Please remember that array formulas need to be entered via Ctrl + Shift + Enter, not just ENTER. If you want to average cells based on several numeric criteria and greater than / less than conditions combined with OR logic, the formula discussed in the previous example won't work because you cannot fit those logical expressions into an array. The solution is using the SUM function in an array formula. Supposing you have Qty. in column B and Sales in column C, and would like to average Sales that have a value greater than 50 either in column B or C. At that, you want to avoid duplicates, i.e. don't count a row twice because it has value greater than 50 both in column B and D.
Remember, it's an array formula, and therefore you should press Ctrl + Shift + Enter to enter it correctly. As you can see, the formula consists of 2 parts. In the first part, you use the IF function with the OR statement in the logical_test argument (C2:C8>50)+(D2:D8>50). As you probably know, in array formulas, plus (+) acts like an OR operator (for more details, please see AND and OR operators in Excel array formulas). So, the first part of the formula adds up the values in column C if either condition is met. The second part returns the count of such cells, and then you divide the sum by the count to find the average. The average formula with multiple OR criteria corresponding to blank and non-blank cells is very similar to the one we have just discussed. The following array formula finds the Qty. average (column B) if either a date (col. B) or status (col. C) is listed, i.e. if column B or C is not empty. To average values in column D corresponding to empty cells either in B or C, replace the non-blank operator (<>"") with blank operator (=""). Concatenating the ranges with an ampersand won't work in this case. This is also an array formula, so remember to press Ctrl + Shift + Enter, not just Enter. This is how you calculate average in Excel. For better understanding of the formulas, feel free to download the Excel Average worksheet. In the next article, we will discuss a couple of formulas find weighted average in Excel and you might be surprised to know that it's much easier than it sounds. I thank you for reading and hope to see you on our blog next week! 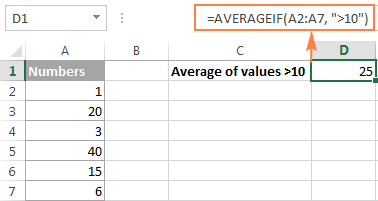 77 Responses to "How to calculate average (mean) in Excel - AVERAGE, AVERAGEIF, AVERAGEIFS formula examples"
I need to average on a averageifs formula for a range that includes na() and Div/0! This formula above averages between dates and times for the selected date and time range. The data to average is in column l, data in A, times in B. For us to be able to assist you better, please send us a small sample table with your data in Excel to support@ablebits.com. Please also include the expected result. Thank you. Svetlana, I have a large data set of over 500 referential urls. The table contains both a count of page views and times spent on the page. I have the following formula that allows me to create a report that gauges interest by keyword in the urls. I need a formula which will filter the following conditions I used in my sumproduct formulat but which will give me an average instead of a sumproduct. Everything I have tried to make this happen has not worked. How can I use what you write above to accomplish this task. Your help would be appreciated. Many Thanks. For us to be able to help you better, we need the original math formula you use. Or your workbook with the expected result. You can email the details at support@ablebits.com. – thanks for dropping by man! I like that you bring in a number of other areas and tie it into creation, I completely agree that this is the mode and task of the church today — to create a forum and median for pattpciiarion [in the Kingdom of God]. I am working with data spread over 30years and need to find the average for figures which are above 0.5 in the data. I have tried using the averageifs but keeps receiving error message. Attached is a screen shot. Kindly advice how i can proceed. We are trying to use the averageifs function over an array of number from C2:O1090 - is this possible as all examples point to a column average only? Thank you for your question! Until now I haven't realized that all the examples in this tutorial are for a column average, maybe because it's the most typical task. Is there any way to use the range in AVERAGEIFS? I have a block of data and need to take the average based on a column criteria and row criteria. Thanks. 80	Fail	92	Pass	#DIV/0! #DIV/0! How get the average and sum this range ? How can I make the averageifs between two dates work if the average range and the criteria range are in different tabs to the date references? This returns Div/0 but if I look at only one date (there are multiple items per date) then it works fine. I'm try to create a formula that takes a percentage in four cells per page up to 6 pages. So with a possibility of 24 total entries. that I fill in weekly. Lets say I only have 18 entries that week. So I will like the formula to see that there is only 18 entries and give me the average percentage on those 18 entries not the total 24, the rest will be zero. In the current page the cells are position in (H18,B18,B5,H5) location. 0	505 0	0	346	0	?? Within Cells A33:A151, I have options of saying either "LISTING" or "DBL END". This formula works, however, I am having trouble writing the formula so that when a cell within A33:A151 says "DBL END" (as opposed to "LISTING"), Cell N152 still calculates accordingly. The above formula works for the first of 3304 rows of data. I need to copy the formula down to average the remainder of the scores on each row. I need the middle indicator "Q2" to change based on the row number, but I need the other values to remain the same Q2:Q3304 and H2:H3304. When I copy the rows down, it wants to change the beginning row for each line. Is there a way to do this? Please assist. I need that this formula change the values of the month that i have in the archive (with respect to column), and, i want to do a little macro to update to the next month. What do i need to do? Q Write a function in highlighted green cell to get average down time. For relative newcomers or those returning after a long period of non use of Excel, it might have been better to keep it really simple. I thought it would be straight forward but alas despie reading several internet "help" sources I am no nearer to doing something very simple. I just have about 650 temperature readings in a column of several thousand. The range of the 650 is contiguous. I wast the arithmetic average. "Average(C68:C720)" was the formula I attempted but nothing happens when I press enter. If it's easy why does this not work, & why if there is "a secret" is it not mentioned? However, I also want to restrict to the length of time the subscription has been held ie between two values, say 1 - 3 months. I want to do average of the values using averageif formulae, these values contain 0 also but I want to exclude these Os from the formula. Please suggest which formula to use. Use the AVERAGEIFS function and include "is not equal to 0" ("<>"&0) as one of the criteria. I need to take the average of a large data set, for example for the hour(C) 7 of day(B) 2, hour 8 of day 2 and so on. As you can see some hours have more data points than others. I have to do this for both value rows D and E.
But then I have to manually change the range since it repeats (changes day at ROW34). Then by going down with the expansion cross I will get all the D averages for exactly one day, going sideways will give me the E averages as well, where no data exists I get 0#DVID! which is okay, Still I have to change the ranges and repeat once the day moves on, this works for the mean time as I only have to do one month for now, but eventually I need to do all 365 days. If you could let me know how to include the B column so this is quicker I would appreciate it very much. This was the easy one... now I have to add a column for the minutes, where again the some minutes are missing... so help would be appreciated. Hi, Could you please tell me how can i calculate average excluding blank boxes in excel? 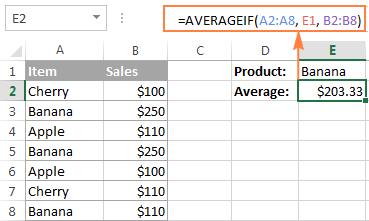 By default, the Excel Average function excludes blank cells from an average, though cells with zero values are included. I am using an AVERAGEIF formula using ranges that have been rounded up and down. When I evaluate my formula the range changes from say 9.0 to 8.999999999 which then means the formula produces a #DIV/0! value. Can you help with sorting this out please? I want to average multiple cells in a row for each task and then copy down the formula rows below. Each cell has a text value which first needs to be converted to number and then the average calculated. E.g. A1="Start" (which equals 0; B1="Mid Point" (which equals 50) and C1="End" and then Column D1=Average(A1:C1) = ((0+50+100)/3)=50. Formula should work for a range of cells without including the condition (if cell="Start",0,if(cell="Mid Point",50,100))for A1,B1...M1 separately. i want to calculate the average among the years like 2003-2009 or 2011-2015 etc. BUT NOT ANSWERING, PLEAE HELP ME IN THIS MATTER. can i use AverageIf function for the criteria by font color? User name Posting Date Time Document no. I want to auto calculate average of every five cells of a column to another column. I have daily rainfall data for 30 years but I want average of every 5 days of each year. Now i want the average formula for A1:R1 to only use the first 3 cells (which are the Actuals now and the remainder are the Forecast) in my result. Example 1 : A1 = 3, E1=2 , J1 = 10, My answer will be A1+E1+J1/3 = 5. Example 2 A1 = 3, E1 = 3, J1 = -, My answer will be A1+E1+J1/3 = 3. Example 3 A1 = -, E1 = -, J1 = -, My answer should be A1+E1+J1/3 = 0. Example 1 and 2 is Ok, Where as in example 3 am getting error #DIV/0! instead of this i need 0 in the box. please note that empty cells are ignored by AVERAGE function. Try entering zero (0) in the cells, if you want zero to return. I am trying to average a selection of non-continous columns, all titled "kcal in". I have set the columns DF2:XA2 as the range, which is the title column. "kcal in" is the crietria and DF4:$XA$435 is the average of all kcal in in the DF4 row. I can drag the formula down to obtain the average for rows DF5 etc. This works well, however, I am trying to exclude any 0 values in row DF4 from the average and I am not sure where to put this criterion. could you help me to calculate the mean with specific interval in excel. In this if there is zero value & either cell is blank in E5 to E310 then value should not be count. Would you please help me calculate the average of the number of households who treat water per each health volunteer for a duration of 3 months? J20="Text" that shows up in column "B". I'm trying to do an average of data in more than one column. can you please tell me if you can do a similar formula when you need to calculate a nested 'min if' formula and need to ignore the blank cells. This is because when I have blank cells in array of data, the result I get for min if is a blank. which is take the average of all data in column V (sheet1) based on all info related to the Truck in column A. Now, I want this formula to read the same information but by consider a range of dates in between 1st of October to 15th (I have dates in Column B in the same sheet1). It apparently do something, but gave me #DIV/0! error, it should give me a 2.53. 1 The ">=" и "<=" conditions in the formula don't contain any spaces. 2 The P2 and P3 cells in your table contain dates. 3 The 'sheet1'!V:V range for calculating an average value is not empty or doesn’t contain text values. 4 The 'sheet1'!A:A and 'sheet1'!B:B ranges with selection criteria are not empty as well. All checked and good to go, but still shows #DIV/0! error instead of 2.53 which I calculated manually. Any other input or any other way to write the formula. but this formula not put what i do? i need Average different sheets and i want to 0 no count in average. I learned some shortcuts. I would like to learn the Macro as well. I hope u can suggest better way to learn the Macro. I was able to use your help to write a rolling average of my income for the past year, thanks a bunch! I have multiple columns of dates in excel and am trying to find an average of workdays between the columns. I want Sheet1 to be my trending sheet and Sheet2 to be the data sheet. Column R: Receipt Date, Column S: Processed Date, Column T: Routed Date, Column U: Approved Date. I want the average over the entire columns. Because they are lifecycle dates, some cells may be blank. For example, something may be processed but not yet routed, another item may be processed, routed, and approved, etc. Right now my calculation is just looking at Column S17:T24 (for troubleshooting and testing) on Sheet 2 and it's "mostly" working and correct but not fully. Once it's fully working and correct I want to move the calculation off to the trending sheet and refer back to the data sheet. 1.) I need the calculation to be fully correct. 2.) I need it to be able to refer successfully to another worksheet in the same workbook. Any help you can provide would be glorious beyond measure! I have a daily work in regards with excel, we had an instruction that goes like this "If the sale of this person is below the average of everyone, the commission must be 5%, and 10% if above the average all. In the column, the result must be either 5% or 10%." I really am having a hard time using the right formula. =AVERAGE(B5,D5,F5) etc currently up to SN5 which is 255 numbers. When I try to add the next one in, I keep getting "You've entered too many arguments for this function" but there are no arguments, it's just an average. I've checked to make sure there are no cells in the calculation that shouldn't be there, and everything looks as it should be. Is there a maximum on the number of data cells in an averages calculation? Surely not? Please help!! I am working working on data in 2 sheets with similar dimensions. The data is for many countries, and stretches over 22 years. Sheet 2 contains values values (exports) corresponding to cartegories 0, 1 and 2. Now, I would like to find average values for each cartegory. In other words I am trying to find the average for Cartegory 0; Cartegory 1 and Cartegory 3. How do I find the average. I need your help, one excel in this formula use, after use this formula i am unable to use this formula.